Last month in an art gallery in Auckland, New Zealand, I stood in front of Silicon Valley billionaire Peter Thiel’s likeness cast in plastic, as a tiny board game figurine raising a shield and arrow in battle with democracy, portrayed as a snarling dragon. Fair elections, depicted as a fierce lion, was coming at him, too. This little plastic Thiel, who is so often depicted in news coverage as a villain and a foe of democracy, was dressed in a cape and thigh-high boots and looked a little like an extremely buff, green Daniel Craig. The narrative of Thiel has always had the glossy sheen of fiction—a wealthy futurist who imagines utopia as government-free, man-made islands in the sea where we all live forever. From this absurd vision of humanity’s “ideal” future, Denny crafted an equally absurd fantasy in board games. Denny’s work has long focused on technology, its social influence and power structures. Though he now lives in Berlin, his work still frequently has New Zealand tie-ins. 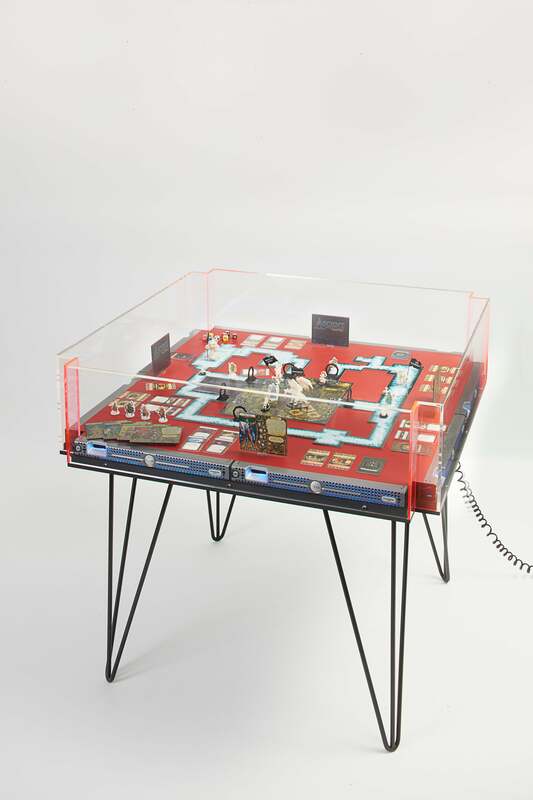 One past exhibition painstakingly recreated the entire inventory of confiscated items taken by police when they raided the New Zealand hideaway of German internet entrepreneur Kim Dotcom. Another, New Zealand’s entry in the 2015 Venice Biennale, used material from the Edward Snowden leaks to explore issues of mass surveillance and national identity. Often his view of technology appears ambiguous. Here it is not the case. Thiel recently received citizenship in New Zealand, and his presence has attracted suspicion. Buffness aside, Denny’s depiction of Thiel is not flattering. 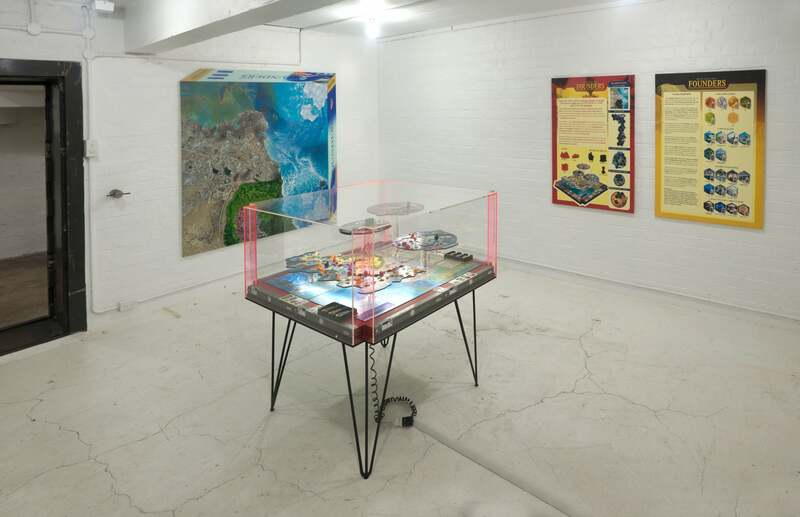 In “The Founder’s Paradox,” on view last month in Auckland, Thiel’s philosophies stand in contrast to the ideologies of Max Harris, a young Oxford-based Kiwi who has argued that New Zealand is undergoing the erosion of communal values. The antidote, he argues, is a new “politics of love.” It seems no accident that on entering the gallery, you ascend to a level of the gallery where reimaginings of co-operative games like Jenga and Twister explore Harris’ work, and then descend into a dank, cold basement to tour the world of Thiel. Thiel—PayPal co-founder, Facebook investor, Trump supporter, immortality-seeker and, it should be mentioned, funder of the lawsuit that bankrupted Gizmodo US’s former parent company, Gawker Media—is a figure more myth than man. “The Founder’s Paradox” is an unpacking of Thiel’s own self-made mythologies, and their hazards. 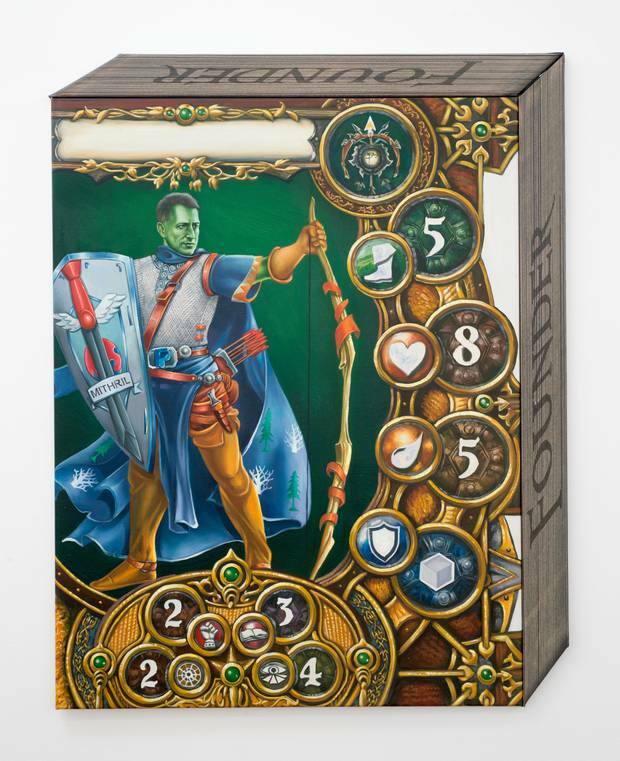 In the most direct skewering of Thiel’s ideologies, Denny casts Thiel as a green-faced “contrarian hero” with anti-ageing powers and a PayPal belt buckle battling monsters including the democracy and public activism in a recasting of the role-playing game Descent. In another, Thiel wields a glowing orb in a game that re-imagines Settlers of Catan as “Founders,” a quest to leave behind Earth’s decaying lands for man-made seasteads, the moon, and Mars. Other nods to Thiel’s work are more subtle. In the Game of Life: Collective or Individual, players have “made it to Stanford” and must make choices between studying the humanities or technology and getting paid in crypto or fiat currency. Players collect literature cards for books including Atlas Shrugged and The Sovereign Individual, works often cited by Thiel. The work is detailed in its study of Thielisms. In Founders, players navigate five different levels, asserting sovereignty through the acquisition of raw materials and capitalist dominance at each one. The first is Earth, rotting under the collapse of the welfare state, a prediction that runs through texts such as James Dale Davidson’s The Sovereign Individual that Thiel has cited as influential in his views. The next level is New Zealand, where Thiel recently and controversially received citizenship. Then on to the Pacific Ocean seasteads that Thiel has famously supported, and finally space colonies on Mars and the moon. 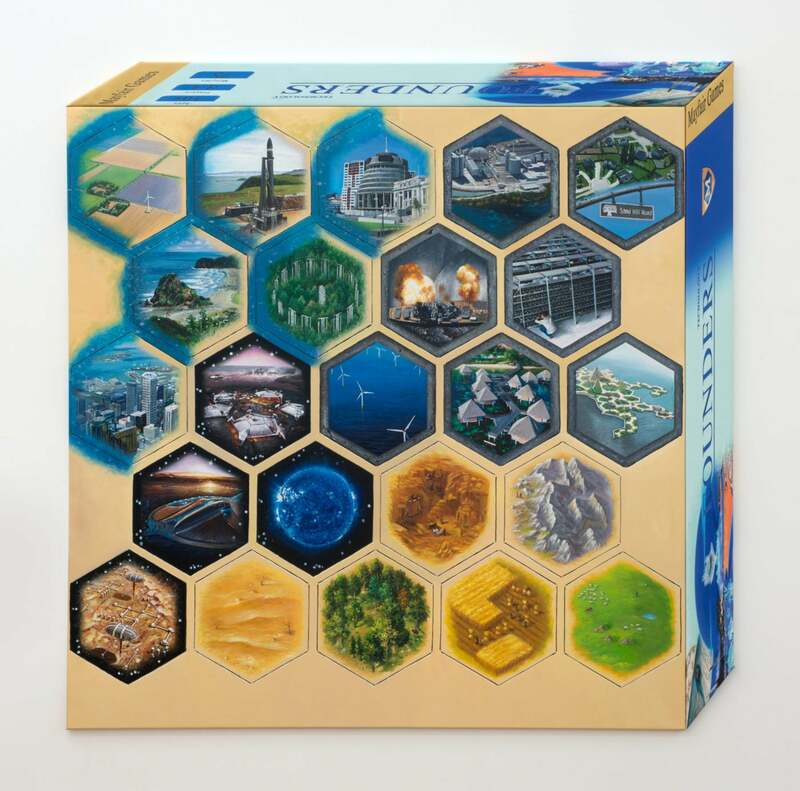 In place of Catan’s robber, a piece that denies players of the opportunity to acquire resources in the original game, is a taxman, a bureaucrat, and a software glitch. The goal of the game, as in all of the mock games revolving around the philosophies of Thiel, is to assert power via the individual, and ultimately, achieve monopoly. It may seem odd that an exhibition in a place so far removed from Silicon Valley would focus so acutely on Thiel, but Thiel is especially visible in this small Pacific nation. In January, it was an investigation by the New Zealand Herald that revealed that Thiel had controversially obtained New Zealand citizenship in 2011 after only spending 12 days in the country, and used that citizenship to purchase land. New Zealand has a long history as a “social laboratory,” a small, relatively forward-thinking nation where new social theories and polices can easily be tested. It seems feasible that Thiel might have his eye on the country as prime lab space for testing out some of his own ideas. “I am happy to say categorically that I have found no other country that aligns more with my view of the future than New Zealand,” Thiel wrote in his citizenship application. At one point, Thiel invested $3 million (£2 million) in Xero, a New Zealand accounting firm, according to the company, and $4 million (£3 million) into a company called Pacific Fibr that hoped to build a trans-Pacific cable. But New Zealand is a nation with socialised healthcare where those who seek success too aggressively are often derided as “tall poppies” — many have viewed his presence in the country as an uncomfortable fit. More broadly, the exhibition also wrangles with changes that has been occurring in New Zealand itself. Thiel is representative of a shift that began in New Zealand with a radical embrace of free market economics in the 1980s. Subsidies were done away with and the New Zealand dollar devalued so that the country might become a bigger part of the global economy. Some feel it was a failed experiment that led to increases in poverty, unemployment and crime. “Founders Paradox” portrays two visions of utopia, radically different from one another. One represents New Zealand continuing on its free market path. The other perhaps a reversion to attitudes about the role of government in life prior to the 1980s. 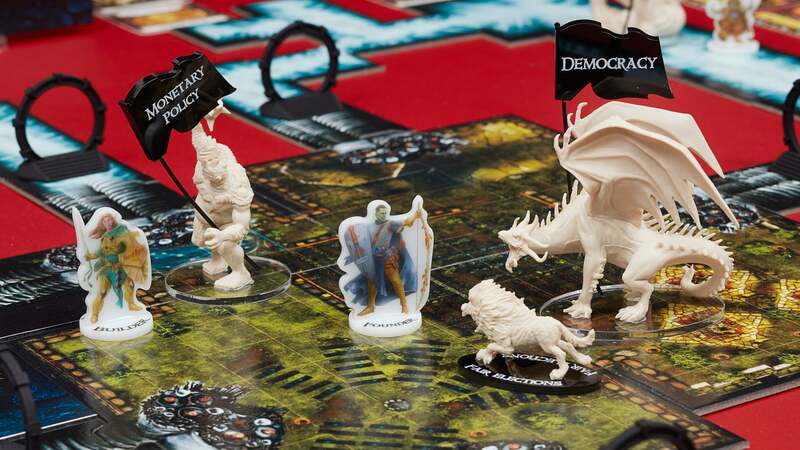 Board games, Denny said, made sense as a medium because the imagery of fantasy and role-playing is present through the tech industry. Thiel’s secretive data company, Palantir, for example, is a reference to the “seeing-stones” in Lord of the Rings. Denny’s past work has appeared ambivalent about the power structures it explores, but in “Founder’s Paradox” it takes a stance. In a sense, Denny’s work asks his fellow countrymen to examine both visions for the future, and make a choice between the two: All for one, or one for all?